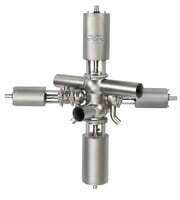 Unique mixproof valves enable the simultaneous flow of two different products or fluids through the same valve without risk of cross-contamination. This enhances plant flexibility and efficiency. A double-seat design provides long-lasting, spillage-free operation thus minimizing the risk of product contamination. The use of double lip seals and leakage detection from all seals provides added protection to ensure safe and hygienic operation. 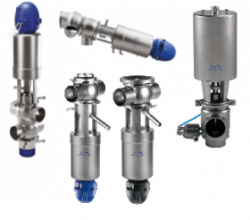 The Alfa Laval Unique mixproof valve concept provides modular solutions that you can easily tailor to your specific requirements. Unique Mixproof Horizontal Tank Valve specially designed for horizontal mounting directly on the tank wall. It improves cleanliness of the horizontal tank connections and ensures that no area of the tank inlet or tank outlet is left uncleaned. For applications with very large particles or highly viscous fluids, this valve offers the same basic advantages as Unique mixproof valves but are specially designed with large openings up to 45 mm in diameter. Same basic advantages as the unique mixproof valves but specially designed for mounting directly on the tank wall at the inlets and outlets. For tank inlet and outlet applications, the Unique mixproof tank outlet (TO) valve offers full drainability and provides cleanability all the way up to the tank without any risk of cross-contamination.